Greetings to the CPA Heroes! We realize that payouts are money and money is the reason why we are all here. Regarding this matter we take this question with full responsibility and do try to avoid delays and pay on time. Terms of payments are Net-20 with minimum payout $200. After the first payment is done other terms (like bi-weekly or weekly) are discussable depending on your traffic volume. 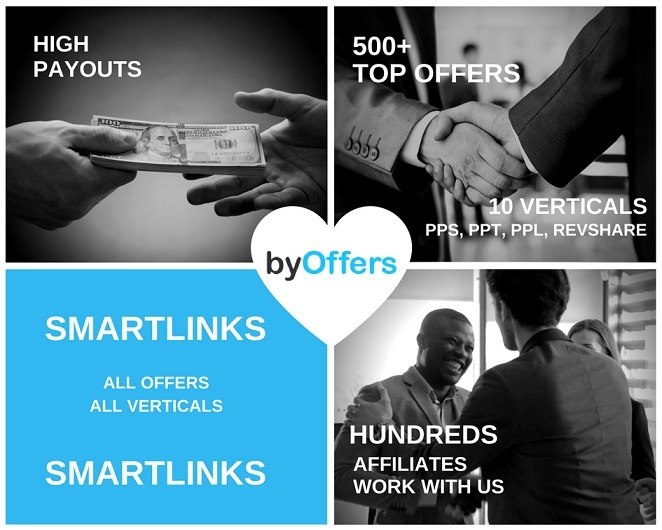 We are happy to announce that we've launched smartlinks for all offer categories. This will help you improve your conversion rate and none of your clicks will go out of the window! You'll be able to pick any offer from more than 10 categories, such as Dating, Adult, Crypto, Sweepstakes, Health, Loans and more! We only work with the best and trusted advertisers. Every day we seek for new more profitable deals and create up to 20 new offers daily. We work with CPL, CPA, PPS, RevShare. Hundreds of affiliates are working with us now. We will provide you a personal account manager who will answer any question you ask. Interested? We wll be glad to see you Signup or Login to view earning guides for mobile apps and websites. to test our offers. Still have questions? You are welcome to ask them in this thread or you can do it in Skype byoffers or via e-mail [email protected]. Come on! Earlier you will start - more you will get. Always welcome - click Signup or Login to view earning guides for mobile apps and websites. Hello affiliates! We are glad to share with you here some useful tips regarding the choice of the right offer for your type of traffic! It is well-known that the beginning is a half of the result. In affiliate marketing the beginning of the coordinate system named “earnings” is considered to be an offer! So today, our webmates, we will provide you with several basic tips to keep you save from fatal mistakes and choose a potentially profitable offer! - One and the same offer, depending on the source of traffic, can show a completely different result, so it is very important to choose the right combination of traffic and offer. Why so? Firstly, traffic sources have their own restrictions on goods and services advertised, and secondly, the audience of each advertising channel responds well only to certain categories of offers. - Offers also have their own restrictions on traffic sources. In the description of the offer you can also find an enumeration of countries and regions from which it receives traffic. The advertiser’s requirements for the traffic source must be complied without fail not to receive the punishment due to a violation of the rules. - An important criterion for choosing an offer is the complexity of the target action that a user needs to perform in order for you to be credited and paid for the lead. The simpler the target, the greater the conversion rate and the shorter is the period between a click on the advertisement and an execution of the target action. - Monitor what is now on the TOP listings of CPA networks. - Type the name of the offer in the search engine and look at the number of ads in ad units. If all places are occupied, then this is the first sign that the offer is more alive than dead. But unfortunately, this method does not provide an accurate picture of what is happening. - Google Trend allows you to assess the current popularity of the offer and the stage in which it is located. - Look at your colleagues. There is another good way to not only check the relevance of the selected offer, but also to find other profitable offers - see what the competitors are promoting. - Seasonality. Some categories of offers have such a trait as seasonality, due to which the demand for them changes cyclically over the time. A good example is weight loss products. Knowledge of seasonality not only makes it possible to start working with an offer when the demand for it hugely increases, but also allows you to prepare your personal ‘offer calendar’ for the whole year. To do this, it is just enough to study in advance the seasonality of different categories of offers and make for yourself appropriate reminders in the calendar that it is time to start preparing creatives and setting up advertising campaigns for this product. - It is necessary to study the quality of the landing page itself before you push the traffic, because this page is the first thing that users see! We highly recommend to use your own built landing pages and test several samples to see what converts better. So you must do it right now. Register on the Signup or Login to view earning guides for mobile apps and websites. Use your promo-code BYOFFERS and get a free period of usage for a month! Sign up link Signup or Login to view earning guides for mobile apps and websites.